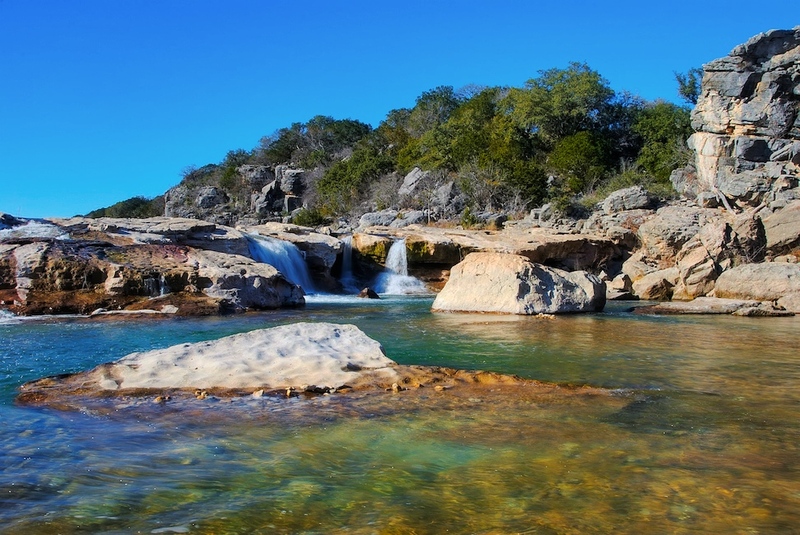 This was taken at Pedernales Falls State Park, which is about 30 minutes west of Austin in the Texas Hill Country. Here in TX we pronounce it "purd-nal-us" though that doesn't follow the spelling too closely. I have seen the signs to this place for years, and heard about it, and have seen pictures - but I never made it until this past weekend. It is marvelous. It's a real gem and so close to Austin. I can't believe I waited all this time to get here! Well, the good news about me waiting is at least now I shot it in HDR which really helps bring the natural beauty of this place to the photo. There are a number of waterfalls in the park, and places where the water runs over long open flat spaces of limestone rock and an awesome series of cascades and pools. There is plenty of opportunity for photography, not to mention some good exercise as you hike around and over rocks to get into new vantage points (which I did a lot of!). I am being efficient by combining photography with my workouts! We spent a couple of hours here hiking, shooting photos and generally just enjoying the beauty of this fantastic place. This shot is a 7 exposure HDR shot at f/22 (like most of my landscapes, especially ones shot during the daytime since I have plenty of light to work with). I merged them in Photomatix to create a single JPG, then took that into PSE (Curves, Contrast, Unsharp Mask) and finally a light touch in Topaz Adjust to give it a little more pop. I really like how this photo came out. My primary focus was the group of waterfalls there in the middle, but also tried to include as much of the foreground water as I could manage without throwing off the composition. The large rock in the center was a nice element and the colors of both the water and the rocks in it I think add to the overall feel of the picture. Hope you like it!